Ideal for handling free-flowing, granular, pulverized bulk materials. Compact design with single strand high speed roller chain. 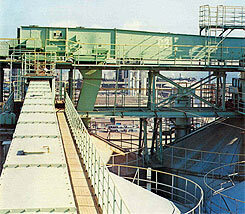 Supplied conveyors with Capacity range up to 500 m3/hr. & Conveyor Length up to 70 m.
The casings are totally enclosed, dust-tight and of rain-proof construction. Offers flexibility of layout viz. multiple inlets and outlets. Conveyor profile horizontal or moderately inclined up to 10 degree. Provided with TSUBAKI, JAPAN make bushed roller chains – with specially designed attachments that ensure smooth flow of material. It is feasible to provide a variety of chain and flight attachments to best suit the characteristics of the material conveyed. Chain roller moves on the bottom guide rail, in the conveying path and on the top guide rail in the return path.